Hop’n Poppet Cheer Cards™, which are part of the Dr. Cupp Readers® program, may be used with any student learning to read sight words. There are 48 sight word cards, and 48 picture cards. Sight words are words that students should know automatically. For the purpose of this program, students are considered to know the sight word automatically if they can say the word in a second or less. Two hundred twenty basic high frequency sight words make up approximately 60% or more of most text. When students learn these 220 sight words, reading fluency and comprehension of text improve. Hop’n Poppet Cheer Cards provide fun and action-packed games that will allow ALL students to find success in learning to read the first 48 sight words. All students need to have a strong sight word vocabulary. For example: All students, gifted, average, and special education, need to know how to read the word go automatically. The difference between how students learn a sight word lies in the number of repetitions needed to learn the word. Gifted students may need one repetition, and average students may need twenty repetitions. The games and strategies used to teach sight words with Hop’n Pop Cheer Cards will work for ALL learners. 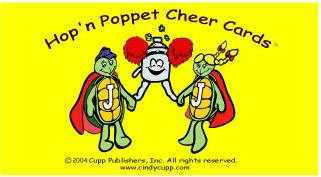 Each Hop’n Poppet Cheer Card™ has a Word Card and a Picture Card. The Word Card shows the word on the front and a sentence using the word on the back. The number on the back of the Word Card matches the order of the sight words taught in Dr. Cupp Readers®. The Picture Card gives a rhyming picture and hand motion that help students remember the word. Directions for the teacher are written on the back of each Picture Card. Word and Picture Cards have corresponding numbers. For example: Jack is the first word introduced in Dr. Cupp Readers® Story Booklet #1. Jack appears in Story Booklet #1 in the first box on page one. The number one is located in the box with the word Jack. In Hop’n Pop Cheer Cards™, the word Jack is also number one in the Word Cards and in the Picture Cards. It is recommended that each classroom have at least three sets of Hop’n Poppet Cheer Cards™. On the following three pages, the teacher will find suggestions for using the cards. These are only suggestions. A teacher should change any game or strategy immediately if it is not meeting the needs of the learner. Hop’n Poppet Cheer Cards™ stand-alone and may be used without Dr. Cupp Readers®. Teachers are encouraged to introduce new sight words in whole class activities. These sight words should be introduced at the pace of the fastest moving group. When whole class games are played, the teacher MUST be very considerate of the slower students and ask them questions concerning only the words covered during their small group.